It flits and twitters just like a canary, and in fact, that is what the goldfinch is - America's wild canary. In my opinion, with his dapper yellow and black with white trim, he is more handsome by far than any tame canary that I have ever seen. The goldfinch is found all over North America in open country, particularly where there are weedy meadows and small trees. The nest is a perfect little cup set in a small tree or shrub from just above the ground to eye level. When it is available, the "cup" is lined with horse hair that is carefully woven to form a smooth cradle for the babies. 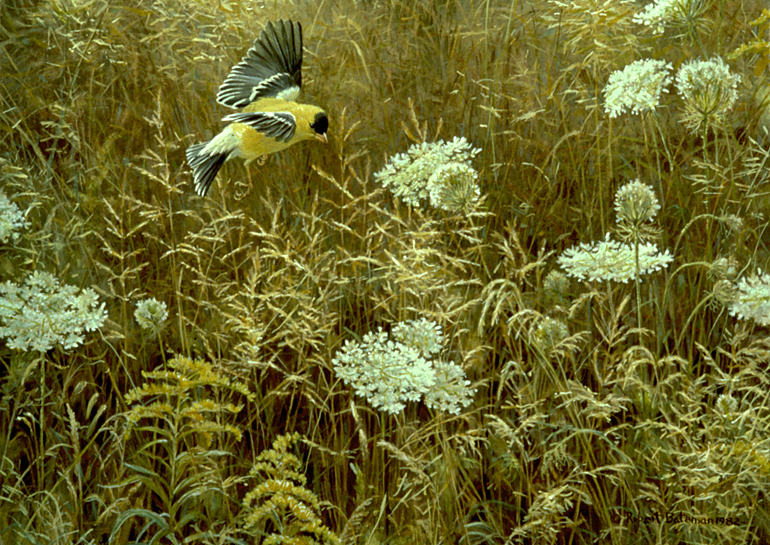 In a sense, the main subject of the painting is the meadow. It is an undistinguished little piece of the world which we all too readily take for granted. In fact, meadows with their multitude of plants are often considered "wasteland" and are cut, or even worse, sprayed with poisons. I feel that when you stop to look at it, a chunk of meadow can give as much pleasure to the eye as acres of tulips. In this particular scene, Queen Anne's lace is the dominant flower. It is jaunty, yet delicate and reminiscent of the finery worn in royal circles a few centuries ago. The goldenrod has a ring of nobility in its name and brings a yellow accent to accompany the bird. My aim is to give a feeling of life, movement and air to this bit of nature. In a sense, I am glorifying a neglected corner of our planet.